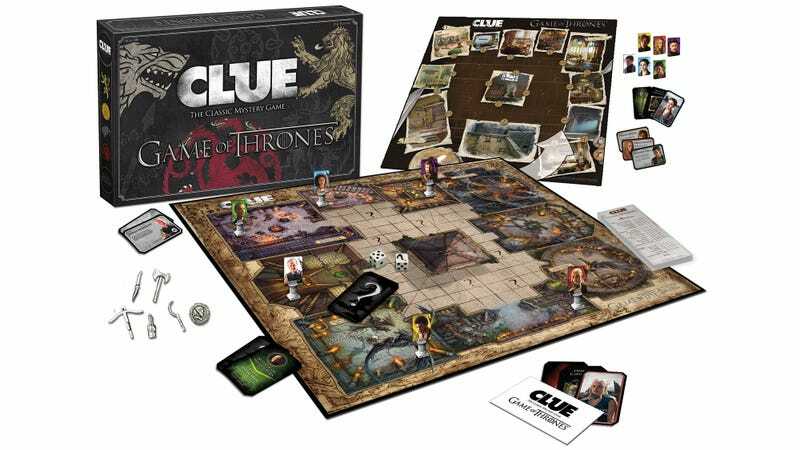 Last year ThinkGeek created a fake version of Clue featuring characters and locales from Game of Thrones for April Fools’ Day. It was a fun prank but also a damn good idea. Which is probably why over a year later there’s now an official version of Game of Thrones Clue that lets players figure out who in Westeros is a killer—or maybe determining who isn’t a killer might be easier? Two to six players can work their way around a custom double-sided board featuring The Red Keep at King’s Landing on one side, and Meereen on the other. There are 12 characters from the series to choose from including Cersei Lannister, Jamie Lannister, Tryion Lannister, Sansa Stark, Petyr Baelish, Margaery Tyrell, Daenerys Targaryen, Hizdahr Zo Loraq, Missandei, Daario Naharis, Jorah Mormont, and Grey Worm, and six different weapons with which they can carry out the dirty deed. Game of Thrones Clue is available now from HBO’s online store for $50, and it’s the perfect way to kill time during the week between new episodes, or while you wait for George R. R. Martin to get that next book finished.